An expert opinion conducted in 2015 revealed that around €11.5 million would be needed to maintain the Multihalle on a long-term basis. The entire roof construction needs to be renovated; the building material is well beyond its ‘best by’ date. Some of the timber elements have been damaged by damp, some of the structural supports are warped. 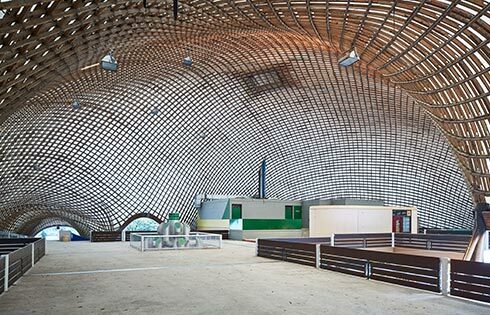 And yet, say the experts who have been monitoring the structural condition over the years, it is astonishing how the Multihalle – originally intended as a temporary building – has stood the test of time. Mannheim’s municipal council resolved that the financing of the renovation and development of a concept for the future use of the Multihalle must be settled by the end of 2019. The funds should principally come from donations and third-party sources. To promote the development, find partners and investors, and to raise the necessary third-party funds, the City of Mannheim and the Baden-Württemberg Chamber of Architects together founded the Multihalle e.V. association. The association is dedicated to preserving the structure and continued existence of the listed building, in close coordination with all the responsible parties from the municipal authorities and Stadtpark Mannheim gGmbH, as owner of the Multihalle (more information).